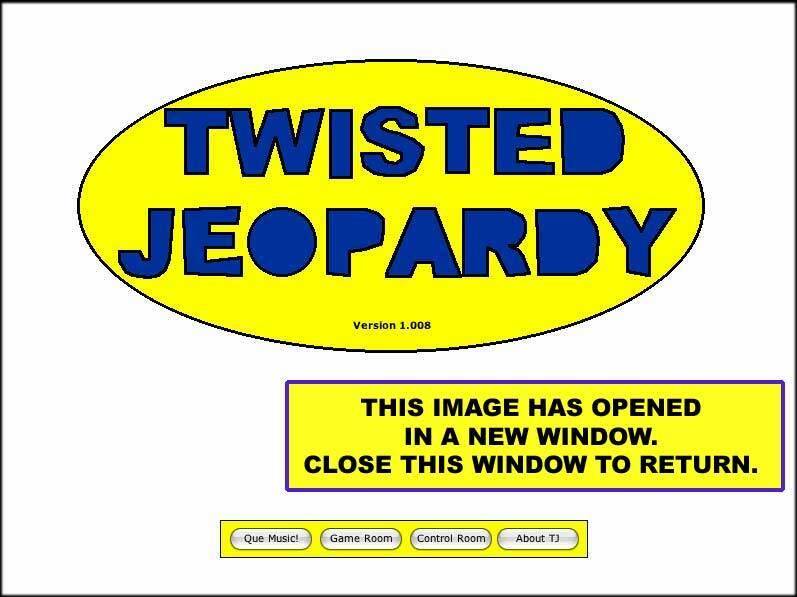 Twisted Jeopardy© (TJ) is a game that can be used in or out of the classroom as a content practice tool. The game is designed for "Smart Classrooms" that have both a computer and a video projector. 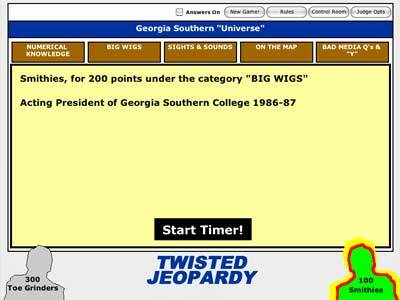 We recommend it be played by one or two players OR by two teams in class with your active participation. TJ was created at the Center for Excellence in Teaching with Revolution. TJ is a free product for use in educational institutions. It is "shareware." That is - It's free, but if you find it useful- please make a contribution (of any amount) to our Center's foundation account #0574. Our mailing address is: CET, PO Box 8143, Georgia Southern University, Statesboro, GA 30460-8143. Thanks in advance! The idea for this game started in 1998 when Dr. June Alberto (GS School of Nursing) asked for assistance in creating an interactive game resource for her Nursing Research course. We first created the game in PowerPoint (Research Peril). The result was a static (questions/answers did not change in content or position) game which was scalable (others could download and modify the file for use in their course) but quite time consuming to edit for another content area. Our second version was created using Macromedia Authorware. It was much more dynamic. 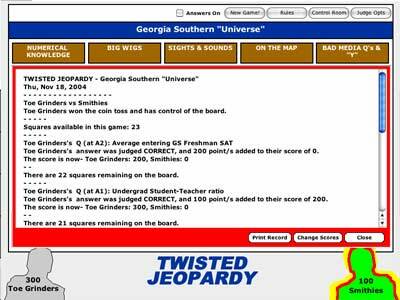 Scoring was maintained for two players and content was randomized so that content was located in different locations on the board each time the game was played. We wrote many if-then-else statements to judge the typed input required for player interactions. This resulted in a game was not really scalable. Instructors wanting to "clone" the game for their discipline would need to rely on a person familiar with Authorware to edit the content and assessment criteria. Hopefully, this version resolves many of those limitations. 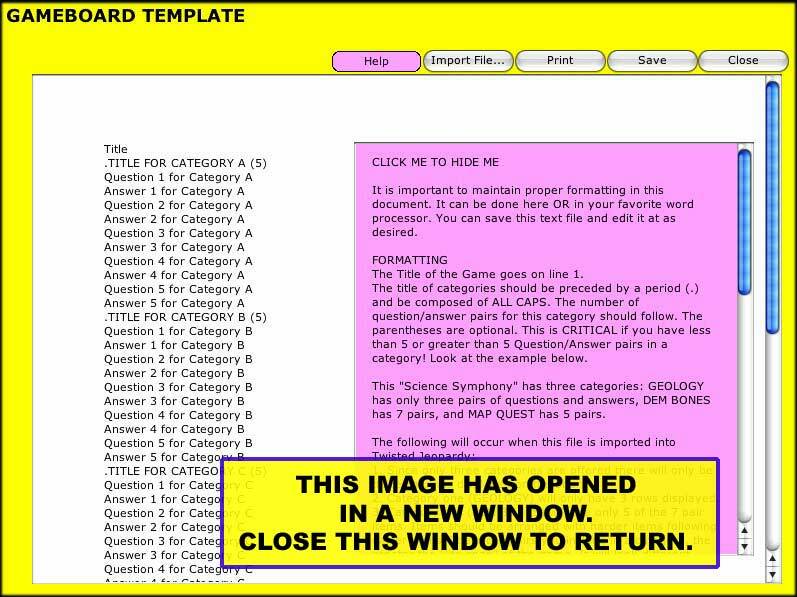 The game is potentially VERY dynamic and quite scalable in that it only requires the instructor to edit a text template to re-purpose the game. The nature of your game inquiries are completly up to you. You can easily use traditional exam items (true-false, multiple choice, fill-in, short answer, BUT you can also require more in-depth responses if desired. Below are some screen snapshots (half-sized) with related comments, that will provide a quick overview of the game interface and capabilities. At the bottom of this page you can download the game, game files, and support material. Click image above for full sized image in a new window. This is true for each image displayed here. The Que Music button will repeat the animation/music. The Game Room button links you to the Game Room (image 2). The Control Room button links you to the Control Room interface (image 4) where the game can be edited. The About TJ button is a link to this website. The GAME ROOM is where all the playing action takes place. 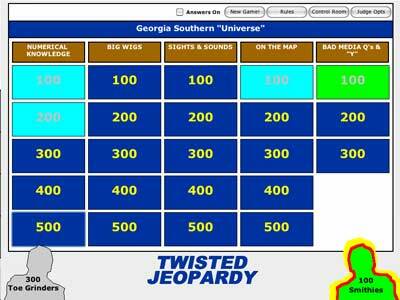 This screen displays the game title and up to five category titles, and up to five Q/A (question/answer) squares below each category. If you have less than five Q/A pairs in a category, only that number of items will be displayed. Point values appear in the squares. The questions are arranged on the board with the easier questions nearest the top of the board. The game can be player by one or two players. We suggest it be used in the classroom by two teams- each member contributing in turn. 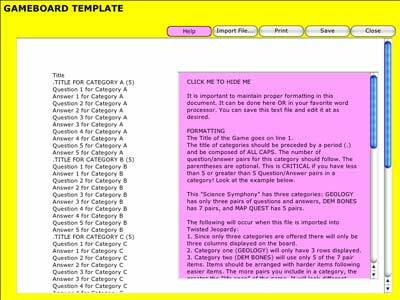 The instructor acts as both the game host ("cue cards" display suggested host directions) and the judge. Scoring is kept as squares are attacked (points added for a successful capture OR points dedcuted for an unsuccessful attack). As squares are captured they take on the color of their captors (player 1 is blue, player 2 is green). With the Answers On checkbox active the question WITH the answer will be displayed after a correct response. New Game needs no explanation. The Rules button displays a text box with the rules of the game. The Control Room button links you to the Control Room (image 5) where you can edit the game settings and content. The Judge Opts button provides a couple of options; a. View the game record and b. Change a players score. See more about Judge Opts in image 4. This image shows the GAME ROOM as it appears after a player has chosen a square. 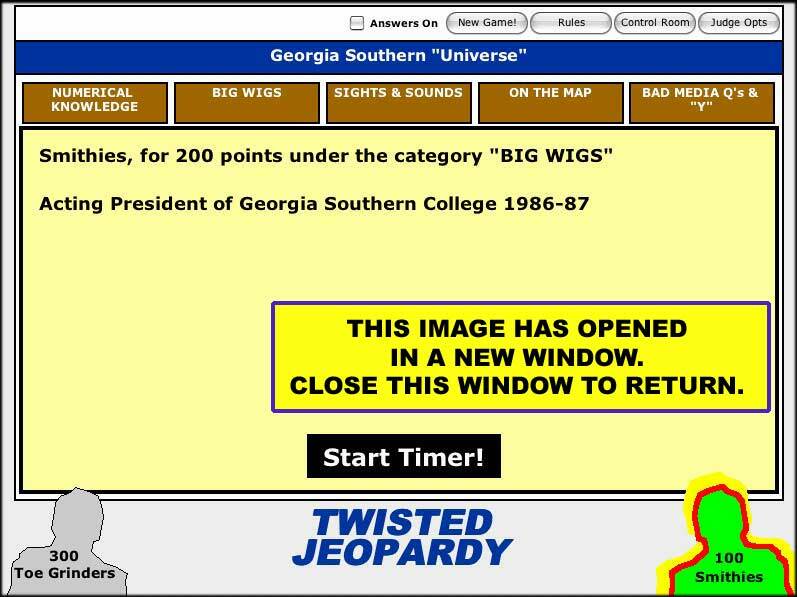 The game host (instructor) clicks the square identified ("Big Wigs for 200" in this case), reads the question aloud, and starts the 5 second timer. The player must respond verbally and correctly (determined by the judge) to capture the square. Questions (and/or answers) can be fairly long, but must only consist of ONE line. NOT 1 sentence!!! A "line" ends when you hit the enter key. Questions can be composed of multiple sentences, and can include web links so that you can display images, or play audio or video clips as part of the question. Formatting this kind of question is detailed in the support documentation. When the Judge Opts button is clicked you will be required to enter your password. Request your password on this website. This screen allows you to look over the game record in a scrolling text box (within the red rectangle at left). There are three additional buttons revealed in the Judge Opts mode; Print Record, Change Scores, and Close. This record will be useful if challenges are made by either player. Here too, you will be able to change a players score if warranted. the point values for square rows. 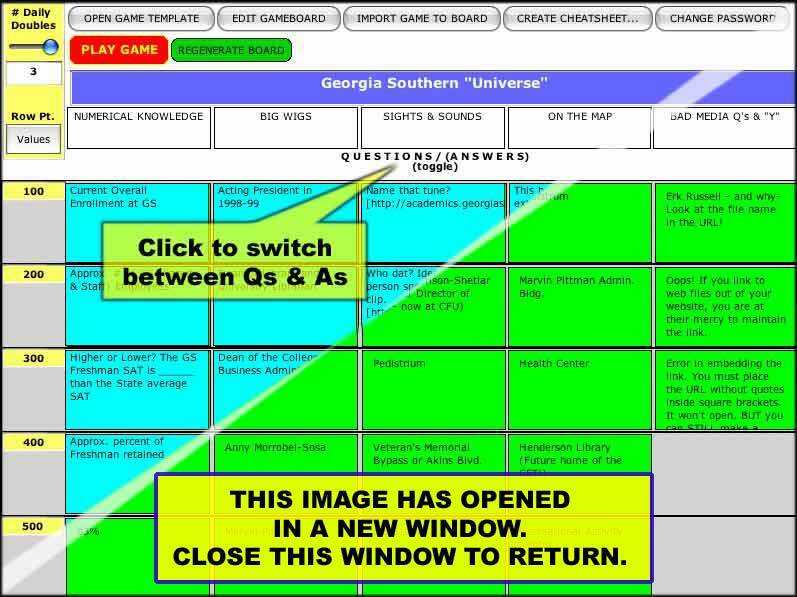 You can also view current gameboard Q/A pairs and create new game files (image 6) or import existing game files (look at a sample text gamefile) to the gameboard. 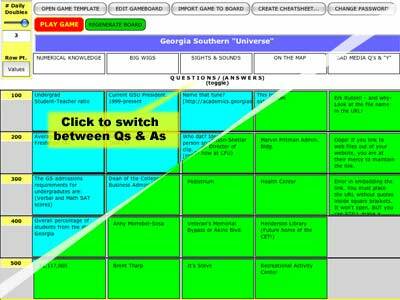 You can also create a game host "cheatsheet" that provides you with Question/Answer pairs for your games. Lastly, your password can be changed in this location. This shot is a look at the Game Template screen accessed within the Control Room. The pink text box contains formatting "rules" for this file. The white text document contains lines of text that can be replaced by your game content. 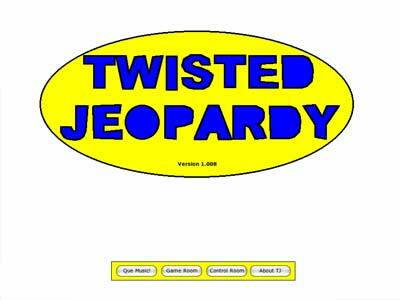 This is where you will most likely create your own game files and then import them into the Twisted Jeopardy game. This web page's purpose is to provide game distribution and support and to faciliate communication between game users of the product and the designer/developer. You can now save your last imported file and game settings as the game default. Here are a couple of Q/A pairs that will utilize media. Q1 uses local media. Q2 uses on-line media. When you save your file you'll be asked to browse to locate the media file. In this specific case the dialog box will appear as below. Note that the titlebar provides both QUESTION and ANSWER ques to assist you in selecting the proper file. Make sure that your media files are located somewhere inside your 'Media' folder within your 'Twisted Jeopardy' folder. Note that in the link to online media you must provide the absolute URL including the protocol. Only the http protocol is supported at this time. The answer of course will take more than ninety seconds! But here goes... blah, blah, blah. NOTE that in the two Q/A pairs above a non-default response interval is provided AND that interval is indicated within the question line. This is a good practice. If the player will have a longer or shorter response interval provide them a "heads up" through this technique. (consult) blah, blah, blah.... blah, blah, blah.... (consult) blah, blah, blah. Question 5 is a PAIR Q: item. That indicates that for this question the player may legally consult with his/her assigned partner (Think of it as TJs "phone a friend" option.) at any time during the countdown. You may also employ"TEAM Q" question items where anyone on the players team may answer. BUT be wary of this practice. Only use it for very difficult items. Frequent use of PAIR & TEAM items may reduce levels of responsibility for individuals to prepare for playing the game. Related to the preceedding optional (and lengthy) response times-- simply click AND hold atop the countdown timer to EXIT the countdown once it has started. an option to require "capture sequencing" (only after the 100 square is captured would the 200 square become available in the same category). This would provide more structure in building concepts during play. Valuable? Your suggestions are always welcome. Let me know what would be of value to you in your discipline. This version is still betaware. Getting close though! These streaming videos show the game being played and a game file being created.